Just the other day I stumbled upon a question that wasn't really answerable in its current form, and the (close-)voting on it indicated that. Some people left some constructive questions in comments as well on why the question was unclear and what could be improved. I have so many questions about your question I don't even know where to start. To me, it was obvious that that comment was neither polite, nor constructive, nor asking for any kind of clarification. Saying "I have so many questions" does not tell the OP what part of their question is unclear, and only adds insult to injury. Perhaps the commenter doesn't speak English very well, or they don't know how to work with the tagged language, making it their very own problem and not the OP's. Which unleashed an upvoted shitstorm in comments against me that now I was the one not being constructive. I know I can flag as "not constructive" (I did) and leave it at that, but that won't teach that user anything: they'll just notice their comment has disappeared, if they even do notice, and that'll be that. In that sense, flagging as "not constructive" is not constructive in and of itself. So: how can I enlighten a user that they may not be as constructive or funny as they think they are? "How can I enlighten a user that they may not be as constructive or funny as they think they are?" Flag the comment and move on. If the user is repeatedly flagged for comments like these, moderators will notice and have a little chat with said user. 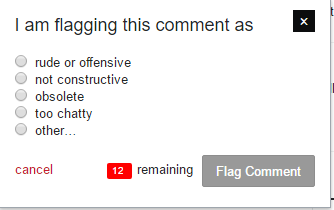 You can flag comments as non-constructive. Don't try and tell the commentor that they aren't being helpful. If you can leave constructive comments yourself then do so, otherwise flag and move on. Is it non-constructive to tell a user without the comment privilege to leave a comment? Are opinion-based comments regarding the complexity of an answer constructive? How to flag comments with constructive as well as non-constructive content?